Parchment Craft, also known as Pergamano, is the art of embellishing and decorating parchment paper (or vellum paper) through the use of techniques such as: embossing, perforating, stippling, cutting and coloring. When I first began learning the fine art of Pergamano, each image was first traced onto vellum using a dip ink pen and white ink before the embossing began. This was, as you might imagine, very tedious, to say the least. Of course, I sometimes love tedious, but don't always have the luxury of that much time. So, I am going to show you a shortcut using rubber stamps. The effect is elegant and unique! 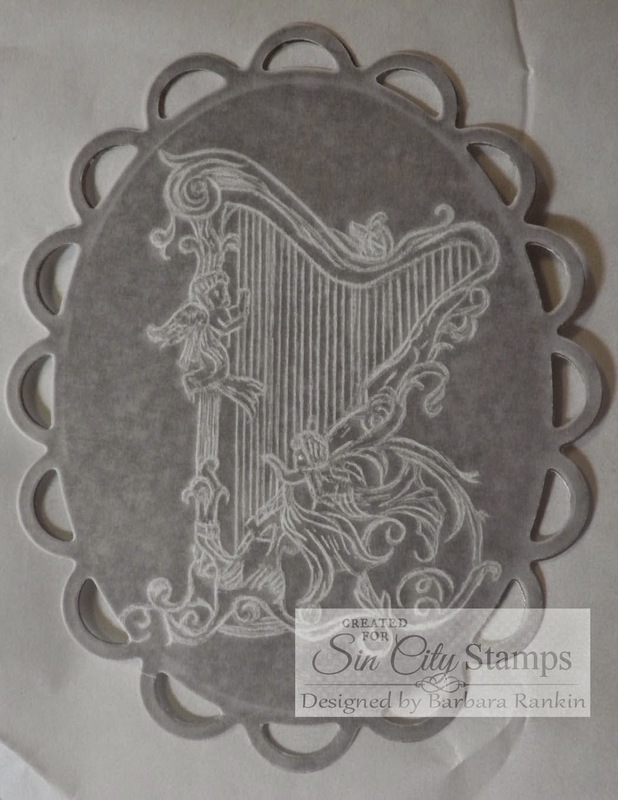 Stamp large harp onto vellum with white StazOn. Let dry. 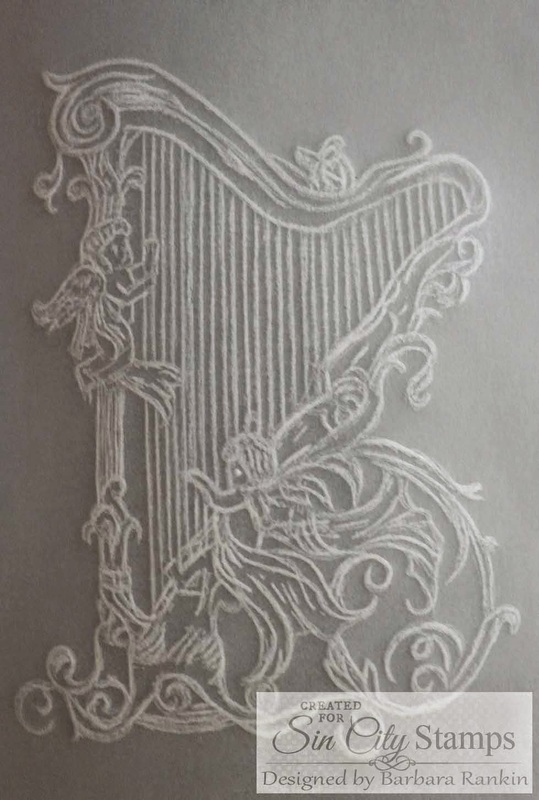 Using an embossing tool with a small ball tip, dry emboss the reverse side of the harp image to raise the stamped lines and whiten the vellum even more. 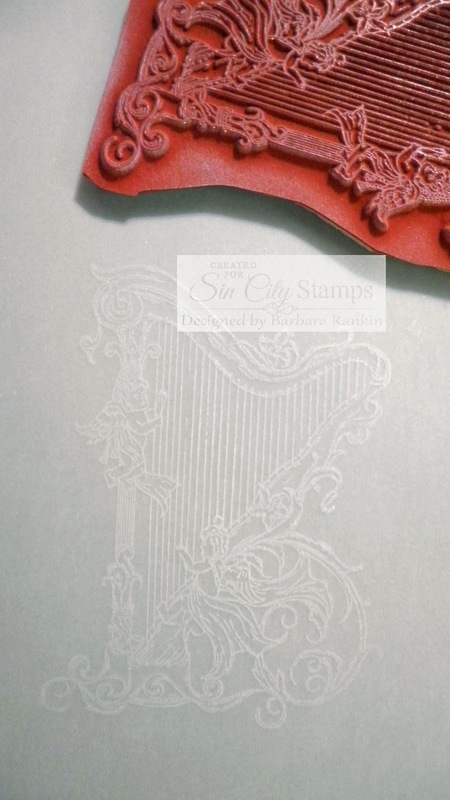 Now, of course, you can skip the embossing with a stylus part and go right for the quick technique, which is to stamp the image with white pigment ink and heat emboss with detail white embossing powder. It may not show well in the photo, but the biggest difference is that the embossing powder leaves a shine. However, if you are a purist, you may want to try the Pergamano technique. It is quite therapeutic and can be done while watching TV, or waiting to pick up the kids. I really enjoy hand embossing my vellum when I have the time. 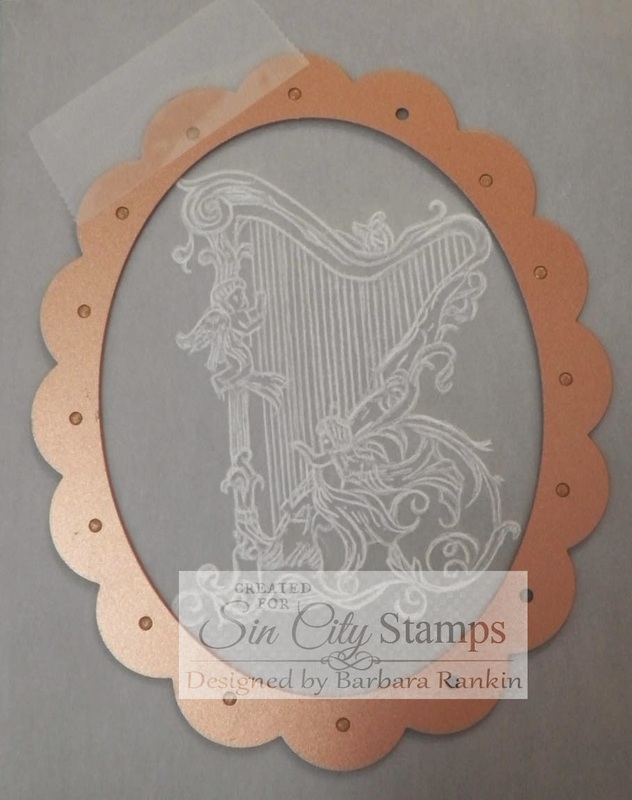 No matter which way you prepare your image, the next step is to cut out the harp image with the lacy oval die, which fits quite nicely inside the pink decorative oval die cut (shown below). 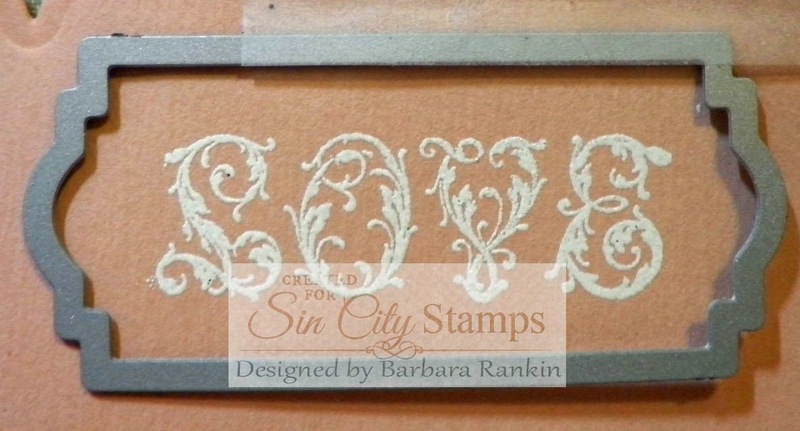 Stamp and heat emboss "LOVE" onto scrap of pink card stock with Versamark ink and white embossing powder. Trim with label die. 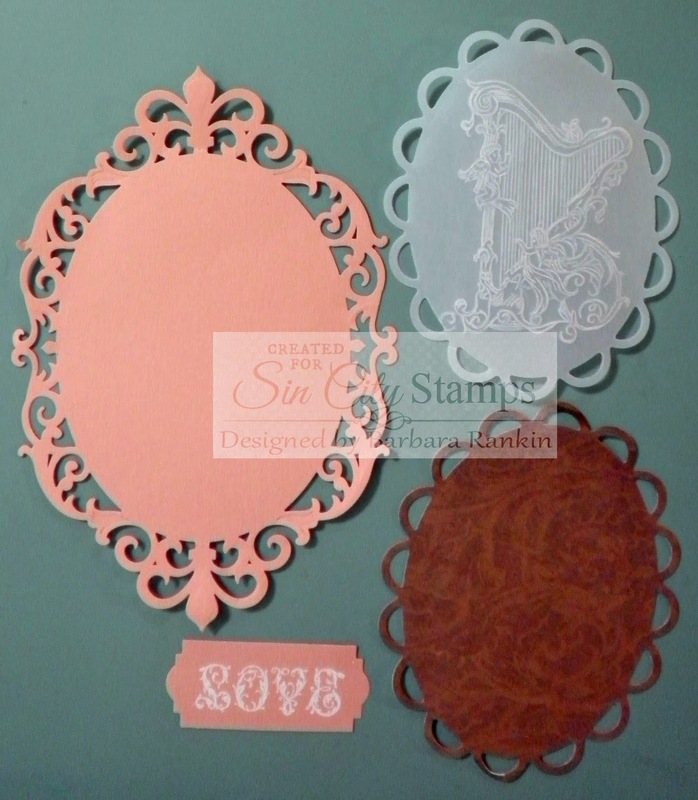 Die cut a second lacy oval from brown print card stock, and a decorative oval from pink card stock. Here are the pieces you will have for your card front. Adhere brown print die cut to the back of the vellum. Vellum needs a strong color beneath it to show off the image. This is a good time to use those really bright colors of card stock that you may have wondered, "What was I thinking?" The trick to adhering vellum to anything without the adhesive showing is to either add the adhesive beneath a part that will be hidden, or in this case, apply the adhesive over the entire piece of vellum. I used my Xyron for this. To put the card together, I cut brown card stock to 10" x 7" to make a side-folded 5"x7" card base. I then cut another piece of the brown print paper to slightly smaller than the card front, roughly distressing the edges, and adhered that to the card. I love the shabby chic with elegant look. 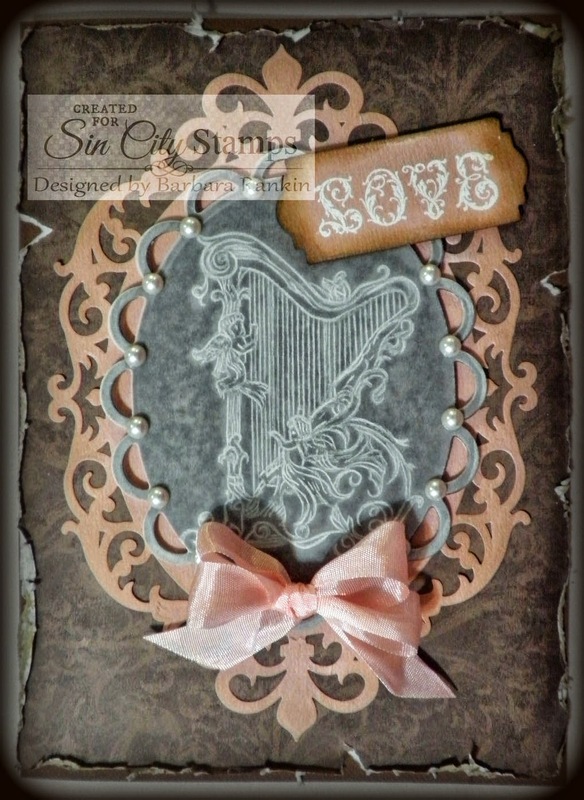 Adhere the pink die cut, then use foam dots to raise the harp image. 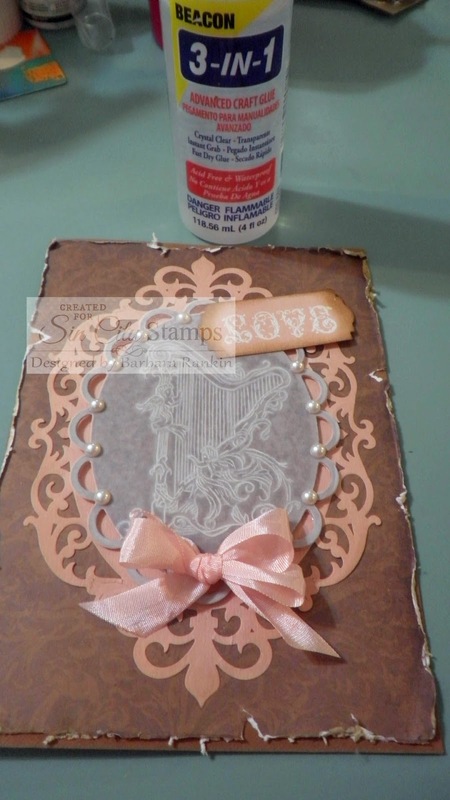 Add some brown distress ink to the edges of the "LOVE" tag and adhere with foam dots. Make a double loop bow with pink seam binding ribbon and adhere to the card with Beacon 3-in-1 glue. Add pearl stickers around the oval for added elegance. There you have it, a beautiful card that looks like you spent many, many hours making, but with the help of rubber stamps, you cut your time in half. I hope I have inspired you today with my Pergamano approach to stamping, or simply stamping an image onto vellum for an easy, beautiful card! 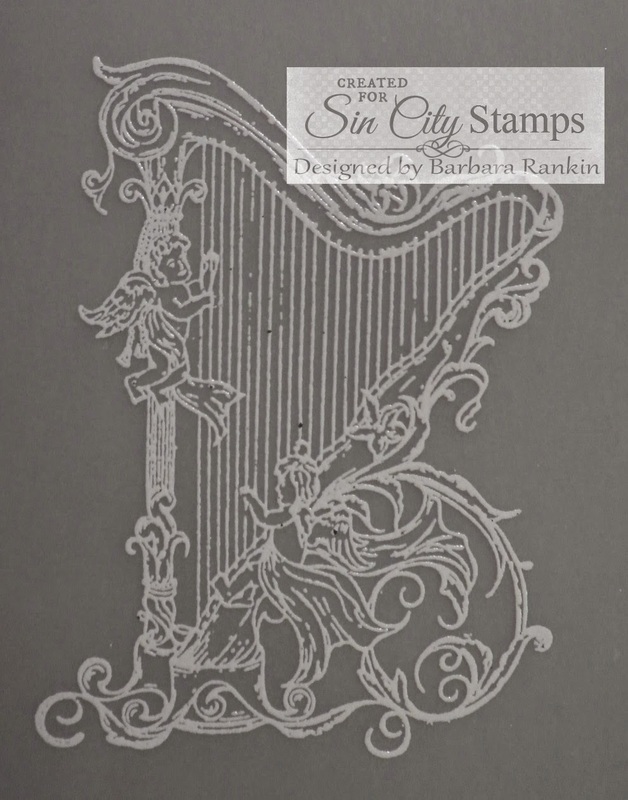 Be sure to like us on Facebook, and stop by the shop to see the beautiful stamps and supplies that Sin City Stamps has to offer. Thanks for stopping by, and have a crafty week! That's beautiful Barbara, I've done both techniques before but did not know the proper name for it! I love learning something new everyday! very informative,, gonna take my stamps and practice soon!! beautiful card! ART JOURNAL PAGE "TEMPUS FUGIT"
The Clock Struck 12 with Tamiko!